Ever since the book - Princess Pumpalot: The Farting Princess - was published in July 2012, we've been collecting photographs (from all over the world) of people posing with the book. So, if you've purchased a copy of the book recently, please send a suitable photograph to robin@cadies.co.uk and we shall add it to the 'POSE ALBUM'. Check out our PUMPY collection of photographs on FLICKR. Geoffrey the Giraffe, who is learning Italian at the moment, has volunteered to help publicise the 2014 Princess Pumpalot Stage Show. Geoffrey has recorded this short teaser on SoundCloud - Geoffrey the Giraffe Teaser. He was also involved in compiling this 20 second promotional clip on YouTube - 20 Second Teaser. We're in the process of casting our 2014 Edinburgh Festival Fringe show. We'll announce the new line up as soon as we have all the actors in place. 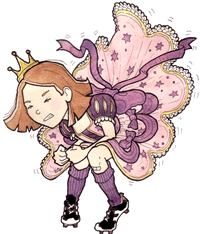 This year's show - Princess Pumpalot: The Farting Princess - will be performed at The New Town Theatre in George Street from 31st July to 24th August (not 12th). Once again, Robin Mitchell (as writer and co-producer) is teaming up with Liam Rudden (as co-producer and Director) in a Cadies Productions / LRStageworks production. On Saturday 8th February, Princess Pumpalot creator Robin Mitchell was reading from his book at Gorebridge Library in Midlothian. His visit was part of National Libraries Day, a week long catalogue of events in schools, colleges, work places and public libraries across the UK. As part of Book Week Scotland (25th November - 1st December 2013), Author Robin Mitchell, with his sparring partner Cameron Pirie, had a great day at Gorebridge Library reading from Princess Pumpalot: The Farting Princess . The local primary school class attended the event took part in various forms of audience participation (including the teachers). The show has received a 4-star review from one4review! […] a nicely rounded show, all in all an excellent choice to take the youngsters to. The show has received a 5-star review from Black Diamond FM! All in all a fantastic show to be enjoyed by kids and big kids like me who like fart jokes and noises but there is enough to keep adults happy too. The show has received a 5-star review from the Edinburgh Evening News! A great way to introduce children to the traditions of live theatre. The show has received a 4-star review from BroadwayBaby! The show was likeable, funny, non patronising and will appeal to both boys and girls aged four to eight. It involved and engaged a potentially very fidgety audience for a full hour and for that it deserves credit. The show has received a 3-star review from EdinburghGuide!